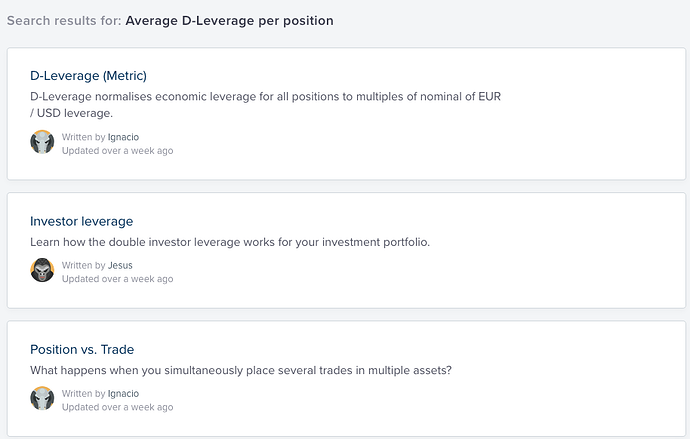 We know that the d-leverage is calculated with the leverage (lots/equity) of the underlying strategy, corrected with the volatility and correlation between the pairs of the position. Suppose a value of 40 of the d-leverage of a strategy. This implies a VAR 80%. In this example, I understand that the d-leverage shown in your new charts would be 5, isn't it? Correct, the average D-leverage per position in the Darwin will be 5. Even if you set 2 years you will find lucky darwins running from one quarter with a return of 40% and a DD of 5%. This is the problem with classical rates, to be reliable they need 3y of trackrecord, this is the reason why Darwinex created Performance, Experience and DScore. What is better: Return and other Return-dependent rates, or DScore ? If you know that 2 years are not reliable enough, you should make a proposal to add 3 years to the filter time ranges. Is this going to be added to backtests too? It doesn't look like it is at the moment. Curious for a graphic that is prominently featured on the Darwins main page. After some months I can say that a chart of DLeverage of the Darwin doesn't add value to my analysis. It tipically ranges from 2 to 6 and mostly depends on the volatility of the markets. DLeverage of the strategy in trading journal much more usefull to dissect the behaviour of the trader. I would like to have details on the impact of AUM on this metric for example. Thanks for pointing this out. We have not included it yet, but it is on the list of new Help Center Articles. For now, we have only included articles about IAs and a bit more. So it may take time before we publish on this. Regarding this, it is not so likely that we talk about this in an article, maybe on a future blog post. FYI, a number over 1 means that it has statistically beaten at least 68% of random strategies. A figure over 1.65 has statistically defeated a minimum of 95% of arbitrary strategies and a number over 2 has statistically beaten 99% or more random strategies. This metric is going to complement the Pf Investable Atribute by assesing the risk/return ratio since inception -in contrast to the last 12 D-periods of experience we use for the Pf-. It is something similar to the Sharpe Ratio since it is a way to examine the performance of an investment by adjusting for its risk. Here we go ! but i understand your question. Please look the Return/Risk daily, weekly, 3M...compared to Inception. Also i understand your question: another estimated ratio ? 68th, 95th, and 99th were provided, but I would also love to know 75, 90, 97.5, 99.9. Let me check it internally. Yes me too, cause how calculated on multi timeframes? But, it seems that a Return:Risk > 1 been a good filter. As Profit Factor, a too high RR (> 3-4?) as a fake/lucky period ? From what I understand, a solid strategy that also trades a ton will have a high return/risk ratio than a solid strategy that trades less (even if they have identical returns), because the larger the sample size, the smaller the variance of sample mean, and thus further from random strategies it should move away (meaning larger return/risk). A good r/r is an indicator of non-lucky trader I think. If r/r is calculated via positions (I think this is most likely), and not trades, then even better indicator of non-lucky trader. 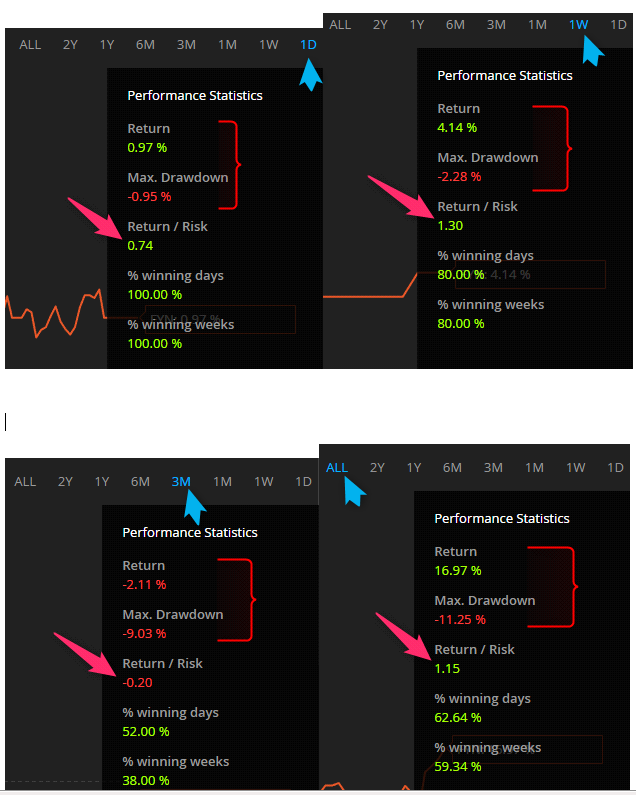 It is like Performance (PF investable attrib) metric, but for the period you select, instead of last 12D periods. I, personally use this to select darwins that I am going to hold. Say, if darwin has r/r ratio of 2 or higher, then we can reject the hypothesis that -this trader a random trader who got lucky- with 99% confidence. Example: darwin SCN, despite having all around good scores and nice return - I am staying away, because I am uncertain (does not meet my 99% confidence criteria) that the results are not just due to luck. La IA reflects a profit < risk ! It's a good way to compare rr. $SCN and $FYN have the SAME return/risk (1,15) and yet SCN seems better than FYN...seems. I think R/R should be approached with caution in short time periods (FYN). Say, a strategy performs well in ranging markets, and when market is ranging, strategy will keep winning, thus outperforming random strategies, and getting high PF IA, and high R/R -> but might not be that good a strategy for holding long term. So probably look at RR starting at least from 1y-2y+ periods? So, for me, highish frequency trading (150+ trades per 6 month), availability of long enough of historical performance data (1Y+) and high RR (2+) -> darwin worthy of considering for holding. Of course, afterwards, many other metrics need looking at, but this is what I consider a good place to start. EDIT: Also, I think you are absolutely right about LA. When two strategies have similar PF and RR, LA should probably be deciding factor of quality measurement. R/R = 1 means the system beats 84.1% of the random systems. R/R = 2 means the system beats 97.7% of the random systems. R/R = 3 means the system beats 99.9% of the random systems, etc. As per the figure above, 68% of the population in a normal distribution are within +/- 1 standard deviations, 95.4% are within +/- 2 standard deviations, 99.7 % are within +/- 3 standard deviations etc. I think R/R should be approached with caution in short time periods (FYN). During short time periods, risk is... unknown ! Despite method witch compute magics calculations involving science caution using complex equations. It is the main way for pseudo science to act.